Nestled in the foothills of the Sangre de Cristo Mountains, New Mexico’s capital city Santa Fe is a beautiful place to call home. Its Historic Eastside neighborhood is an especially lovely area. Featuring majestic single-family homes and estates and a sampling of condos, this neighborhood offers an excellent location, stunning natural beauty, rich heritage, and much more. Regardless of your interests, you will not struggle to fill your free time when you choose to live in this neighborhood. Available properties in Santa Fe’s Historic Eastside neighborhood are ready to impress you, so now is the time to consider what this area has to offer. Whether you are interested in history, the arts, nature, or something else, there will always be something new for you to discover when you are a resident of this neighborhood. For example, you will enjoy strolling around your neighborhood and gazing at the unique and striking architecture of the fantastic residences in the Historic Eastside. You can also appreciate artwork and beauty at one of Santa Fe’s numerous museums or art galleries. Local art festivals further cement this city’s reputation as an arts hub. Regardless of your style, you will easily be able to find events and artwork that will pique your interest. When you are ready to relax in nature, you will enjoy exploring the area’s vibrant landscape. Whether you are hiking in the mountains, ambling through a city park, jogging on a picturesque path, or ice skating in the winter, you will appreciate the myriad of activities that allow you to enjoy the area’s natural beauty. No matter where your adventures lead you, you will be content to think of your Historic Eastside single-family home, estate, or condo awaiting your return. A convenient location, fantastic residences, and plentiful entertainment opportunities ensure that you will enjoy living in this neighborhood. 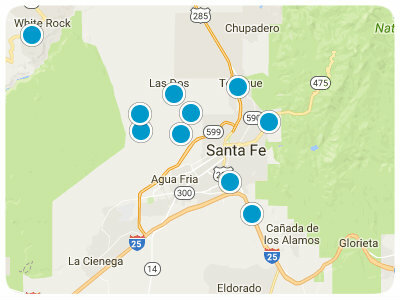 Homes for sale in the Historic Eastside neighborhood of Santa Fe have a lot to offer, and you are certain to find something that will suit your style. If you are ready for more information regarding Historic Eastside, Santa Fe, real estate options, please do not hesitate to contact us.